If you are looking for a fencing company in Elkhart, look no further. Elkhart fencing has the skills required to handle all of your fencing needs. Our knowledgeable staff can help you with price quotes, time estimations, and even deciding what type of fencing will best suit your needs. We use a variety of different building materials and will have a fencing solution to fit your budget. Whatever material you decide on, rest assured that we use only high quality fencing and gates that will stand up to the test of time. Our goal is to install a high quality fence for you that leaves you feeling completely satisfied. Our commitment is to honesty, communication, and fairness as well as providing the best fencing in Elkhart. Below, find a brief description of the services we offer and why we are the best choice of fence companies in Elkhart, Indiana. ​Cedar Fence Installation: Offering privacy and turning your yard into a sanctuary, cedar is an excellent choice of fencing. Cedar does not warp or shrink. If that wasn't enough, oils found naturally in the wood act as a deterrent for bugs and prevent rotting. It also maintains a pleasant smell that many people enjoy. In general, cedar will last longer than any other type of wood when it comes to fencing. It is also an environmentally friendly fencing option. Chain Link Fence Installation: Chain link has long been a staple of fencing, and for a good reason. Offering both safety and security, it is the most economical option in fencing. On top of being budget friendly, this type of fence is incredibly durable. This fence is available in different heights, sizes, and grades. Chain link is a great option for defining the property lines of both homes and commercial businesses. Steps can be taken to add privacy to your chain link fence, such as adding slats or rolled bamboo. Dog Fence Installation: In order to keep your dog safe and inside the boundaries you set, our expert installers can help you design an invisible dog fence system. Unlike wooden or chain fences, your dog will not be able to jump over or dig under these fences, giving you peace of mind that they are staying put. Fence Repair: We are here to help you repair or upgrade your existing fence. If you are noticing corrosion on the posts, pickets, or rails, it is time to give us a call. Other signs that your fence is in need of repair are: leaning posts or fence, broken posts at or below the ground, or panels that have detached from the post. Upgrade options would include adding caps, kickboards, or trim to your fence. Fences are built to last, but regular maintenance at the first sign of trouble can save you a lot of time and money down the road. Let our experts make recommendations on how to get the most out of your current fencing. Metal Gate Installation: Installing a metal gate can increase the value of your home. It can also make your property much easier to navigate. Like our fencing, our gates are designed to be a durable addition to your property. Tell us what you are looking for in a gate and we can come up with a plan to suit your needs. Ask about adding a gate to your driveway, adding additional security to your property and upping its value. Pool Fence Installation: A pool fence can help ensure the safety of your children, animals, and guests. Our installers can work with you to develop a fencing plan that keeps your pool 100% safe. We will make sure you can still perform yard and pool maintenance, as well as keep an adequate walking path around the pool. Adding a fence does not have to take away from the beauty of your yard. Stain and Seal Fence: Our staining services include cleaning, staining, and sealing fences, decks, and other wooden structures in your outdoor space. Benefits of staining and sealing your fence include: extends the life of the wood, makes the wood relatively waterproof, prevents cracks and splitting, shields from U.V. rays, and it helps create resistance to mold, mildew, and bugs. It can also help protect the natural color in your wood as well as restore weathered looking wood. Vinyl Fence Installation: Vinyl is an excellent fencing option due to its durability. Being nearly maintenance free, these fences will neither fade nor rot. Never worry about termites or rust on your fence again. Vinyl fencing almost always add value to your home due to how beautiful it is and how long it will last. It is offered in a variety of colors, sizes, and styles. Some style examples are: post and rail, privacy, contemporary, and ornamental. 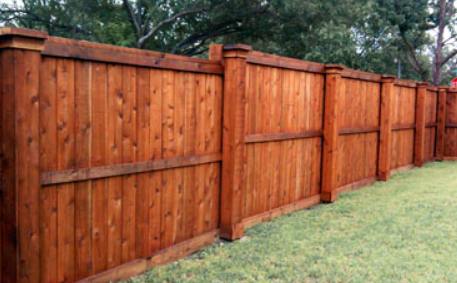 Wooden Fence Installation: Cedar is not the only wood fence on the market. Redwood, cypress, and pine can also make excellent options for both privacy and wooden picket fences. We can construct these fences for you in a variety of shapes and sizes. One advantage of pressure treated pine over cedar is that it stands up better when placed in soil. Cedar fencing is often placed in concrete, something adding to overall expense. Properly treated pine will take on a lovely golden color when it ages. Wrought Iron Fence Installation: Offering both security and beauty for you property, we offer a variety of styles and colors as well as decorative options to personalize your fence for you. The use of the word "wrought" in "wrought iron" refers to its ability to be manipulated into many attractive shapes. Although more expensive, wrought iron is stronger and more durable than wood or vinyl. No matter what your fencing needs are, we hope you will give us a call to help you end up with the fence or gate that best suits you and your property. Be it residential or commercial, we have the know-how to get the job done. We pride ourselves on being the best fencing company in Elkhart, Indiana.